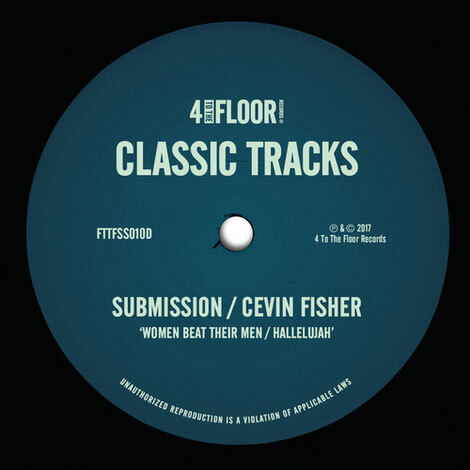 A double bubble release from Cevin Fisher and his alter-ego Submission, this two-tracker delivers a slice of late-90s house. Cevin came of age in the school of Tony Humphries, Larry Levan and Francois K, honing his DJing skills in clubs like Zanzibar then going on to do production work for Motown Records and eventually flourishing as a remixer and producer in his own right. Kevin remains part of the legacy of that scene, and for that reason 4 To The Floor is proud to be unearthing two of his tracks. Kettle drums rule on ‘Women Beat Their Men’, a crunchy and raw house track that stays true to a dominant 4/4 rhythm throughout. On the flip side, on ‘Hallelujah’ the dominating beat remains but the top line is softly harmonised and angelic, creating that classic ‘90s clash of ‘soft and light’ with ‘brash and heavy’ which is nice to hear in 2017.